Sharkoon introduces two new Power Supply series to the market for PC users and gamers who are looking for products from the provider in a particular price-performance range. The WPM series with modular cable system arrives to the market in the three performance classes of 400, 500 and 600 Watts. The models comply with ATX specifications ATX 12V V2.0 and provide an efficiency of over 80 percent. Firmly attached to the power supply are a 20+4 Pin mainboard connector, a 4+4 Pin CPU connector and a 6+2 Pin PCIe connector. The enclosed plug-in cable set consists of a 6-Pin PCI cable, a cable with connections for five optical drives plus Floppy as well as two cables with three SATA connections each. All cables are covered in either fabric or mesh. The WPM power supplies are cooled by a quiet 140 mm fan, which provides care with fewer rotations and noise emissions but a higher airflow. The power supplies work with active power factor correction techniques and are equipped with security features against electrical surges, short circuits and over-currents plus a power switch. Color accents compliment the design of the cover foil on the frame cover, to include a red connector shell and a red interwoven cable cover. With "80 PLUS Bronze" certification, we also present new models to the new QP series. The power supply guarantees to have an efficiency of at least 85 percent at half capacity and at least 82 percent in the range of 20 and 100 percent. 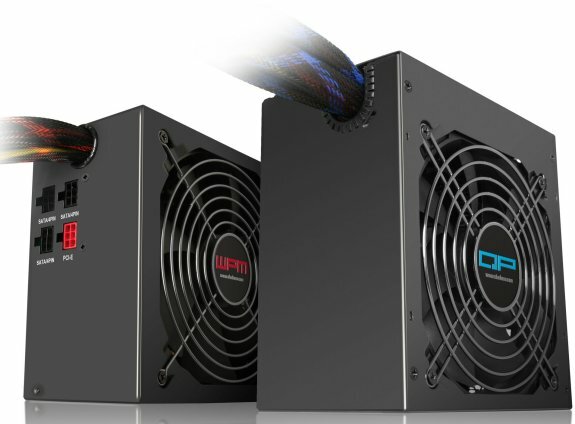 The series also includes three models in 400, 500 and 600 Watts and complies with ATX-Norm ATX 12V V2.3. Two separate 12V circuits supply the individual PC components with stable, steady power. The power supplies are equipped with a 20+4 PIN mainboard port, 4+4 PIN CPU port, six SATA ports, two hard drive ports and a Floppy port. For graphic card accommodation, the 400 Watt model provides a 6-pin PCIe port, the 500 and 600 Watt models also come with a 6+2 pin PCIe connector. Cooling occurs on all models through a 120 mm silent fan. The QP power supplies, in anthracite colored case with a blue logo and blue interwoven cable cover, are also equipped with active security features against electrical surges, short circuits and over-currents plus a power switch. End customers will find the WPM Power Supplies as well as the QP Power Supplies available around the end of November from authorized retailers.